Replace a 10 digit door code with a 4 digit code of your choice. This only applies if you received a 10 digit code. If you already have a 4 digit code, the following information does not apply to you. Do not try to change the 4 digit code. This is against our terms. Only 10 digit codes may be changed. 1) Enter the 10-digit Access Code. 2) After successfully unlocking the lock, within 10 seconds, press the [SCHLAGE] key and your own 4 digitPersonalized Code, then press the [SCHLAGE] key to end. All digits must be entered within 10 seconds. If your Personalized Code is unavailable, you will hear the descending notes and see the red LED flashing. In this case, please try a different Personalized Code. Enter your own Personalized Code, followed by the [SCHLAGE] key. Each digit must be entered in 10 seconds. After ascending notes beep and the green LED flashes, please turn the lock knob in 5 seconds to unlock the lock. Remember: For the 4 digit code you need to press the SCHLAGE button after the numbers to enter. With the 10 digit code you don’t need to press the SCHLAGE button. 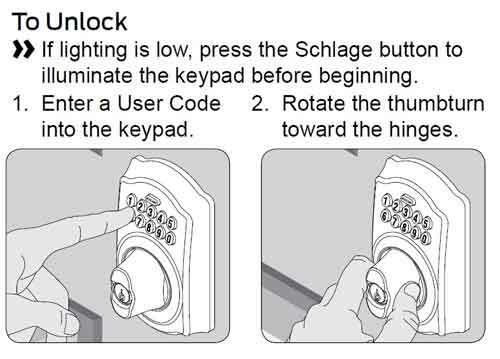 Press the [SCHLAGE] key, after ascending notes beep and the green LED flashes, please turn the lock knob within 5 seconds to lock the lock. The deadbolt will not automatically lock. You must turn the knob in order to throw the deadbolt. You do not need a code to lock the door.